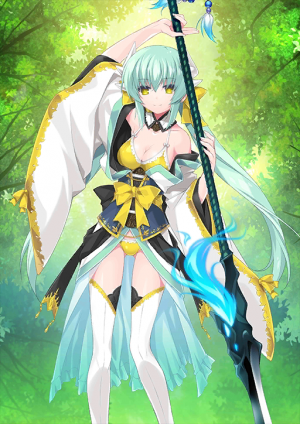 This Article is for the 4★ , Kiyohime . 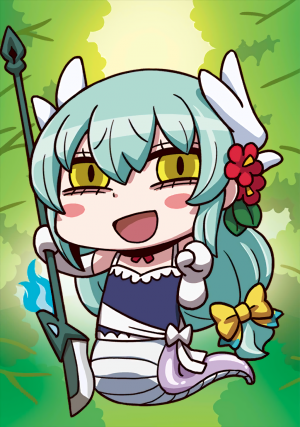 For 3★ , see Kiyohime. Available for summoning during the Chaldea Summer Memory event. Increase your Buster Card effectiveness by 12%. Deal significant damage to single enemy. Inflict Seal Skill to a single enemy. (1 turn). Overcharge: Inflict Burn to a single enemy. (5 turns). Increase Buster Card performance of all allies by 20% while she's on the field but decreases defense by -10%. Burn, burn, burn, burn, burn, burn, burn, burn, burn! Ahhhh yes, his is truly the passionate love! Oh the AGONY... As you can see, Kiyohime is acting kind of weird. Hey you there, saying that she acts weird all the time is forbidden! The woman that lives for a passionate summer love! 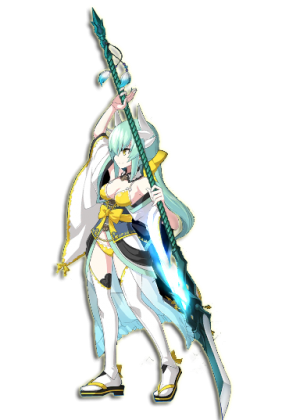 As she has been summoned as a Lancer, she carries a naginata. "As a maiden of course I have been trained in a variety of martial arts. However as a fragile innocent slender-armed woman. I may not e of much help, which is frustrating." Just as she had warned, her ability with the naginata is second-rate, but it is rumored she is unparalleled on the battlefield because of her overflowing bloodlust and mercilessness. Enhanced Stalking. The summer heat powers up Kiyohime a.k.a. Kiyohii's internal engine. Howling entrails, accelerated lungs, and a sigh which leaves a scent of nitro in the air. 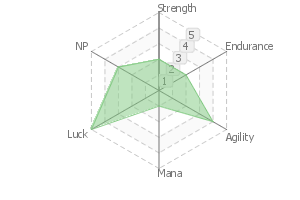 NO matter where her target might be, she'll pursue them at super-high speed. 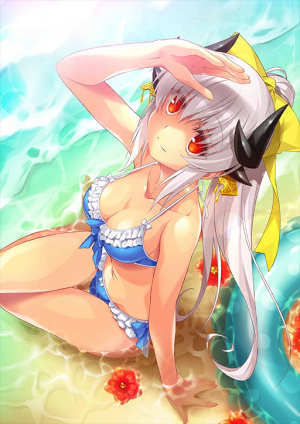 ...Well, she's still the same Kiyohime, but why not take the risk of complimenting her on her swimsuit for once? Summertime is brief... You may as well be trapped within Kiyohime's emotional wave. She traps her opponent in a bell, piercing her naginata into the bell like a twisted game of shooting fish in a barrel. This is one of the more brutal and heat suffocating skills, especially since it is the dead heat of summer. Because of that, Servants that travel with her say she is the worst to be with during the summer. 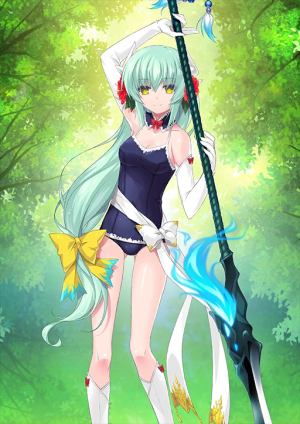 After all, Kiyohime was born in ancient Japan, so she is extremely against the idea of wearing a swimsuit. It seems this is extremely embarrassing for her. Still, she endures it out of her desire to please her Master. So please take this chance to complement her swimsuit; it is sure to help her be at ease. Just keep in mind that nobody is responsible for any possible wardrobe malfunctions. Burn, burn, burnburnburnburnburnburnburn--- alas, this is surely a passionate love! Vexa! Tion! ...as you can see, this is Miss Kiyohime on a strange high tension. Hey you! Don't go saying that her tension being strange is an everyday occurrence. A woman that lives for love (in other words, the same as usual). 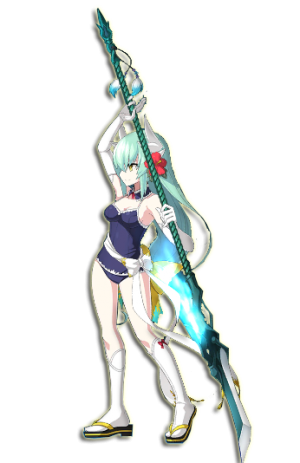 Having been summoned as a Lancer this time around, she possesses a naginata. Her own testimony is: "Of course, as a maiden, I have a general understanding about martial arts. However, with the slender arms of a frail and helpless woman such as myself, it would not come to the point of being useful. Alas, how regretful." Still, while her competency with the naginata is indeed second-rate just as she herself stated, given her overflowing killing-intent and lack of mercy, there are rumors of how she would actually be peerless in the battlefield. Stalking's powered-up version. The summer heat makes Kiyohime's internal engine accelerate. Howling entrails, accelerating lungs, a breath in which the scent of nitro hangs; no matter in which place the other party is, she beings a super-high-high-speed pursuit. 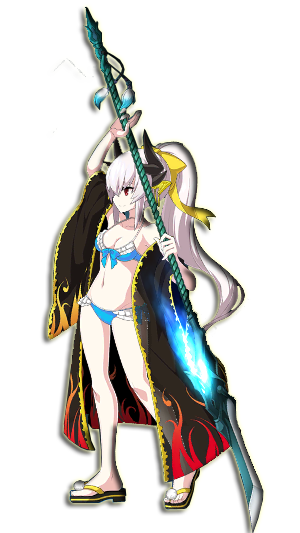 ...well, in other words, it is the same Kiyohime as usual; but how about losing yourself and praising her swimsuit since it is summer. Surely, this summer will pass away in the blink of an eye... under the nuance of being locked up somewhere by a Kiyohime that was overcame with emotion. Doujou-ji Kane, Hyakuhachi-shiki - Karyuu-nagi. Locking up the opponent in a bell, piercing him with a naginata and blowing him away by a hair's breadth. Despite being on the height of summer, it is top-class in regards to being sultry. Because of that, it has an extremely bad reputation among Servants who travel together with her. ...That being said, due also Kiyohime being born in ancient Japan, she has an exceedingly great reluctance towards swimsuits... in short, it seems this is extremely embarrassing for her. And yet, she is gallantly enduring it in order to please the Master. 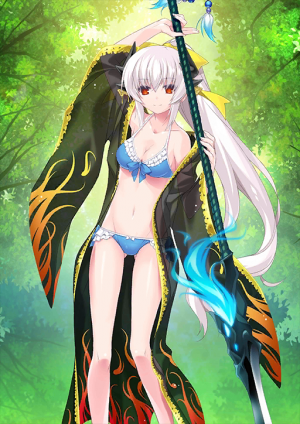 So, in order to also release her tension, you should surely praise that she looks good on a swimsuit. But please be advised, we will not concern ourselves at all with any accident that may arise at that occasion. This page was last modified on 19 August 2018, at 12:53.